Located in Jongno area, in a street perpendicular to Cheonggyecheon (Cheonggye Stream), this little restaurant is very welcoming. Entirely made with wood, you have to leave your shoes at the entrance. As soon as you sit down, the tea and the dishes composing the meal are served. 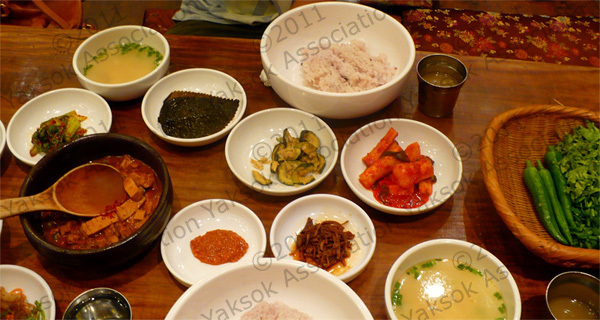 For ￦6000 (~$5,4), the meal is composed by a rice bowl, a soup bowl and around 10 little plates that contain some exotic dishes that are really delicious! The service is quite fast and good (as good as in most Korean restaurants). 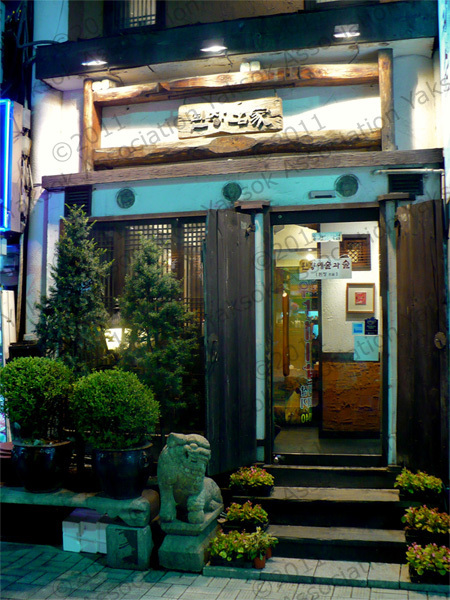 It is a pleasant restaurant that is suitable for a long and tiring day walk through the streets and Korean palaces (Deoksu and Gyeongbok palaces are 10-15 minutes far from this restaurant by foot).